Children and Youth Evaluation Service (C-YES) is the branded name for the State’s Independent Entity. C-YES is responsible for delivering HCBS Eligibility Determinations, and for developing and overseeing HCBS plans of care. 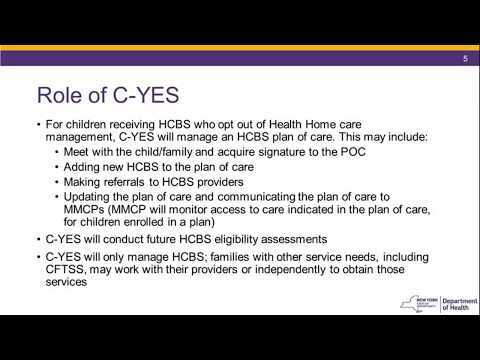 In this webinar, the State provided an overview of how C-YES will support transitioning HCBS waiver children who opt out of Health Home Care Management, from February 1 through March 31. The State will provide a follow up webinar detailing the role of C-YES beginning April 1, 2019.